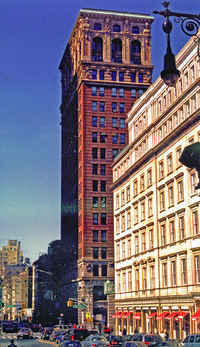 This building follows the columnar prototype of the Broadway-Chambers Building (1899-1900), featuring a base, shaft, and cap. 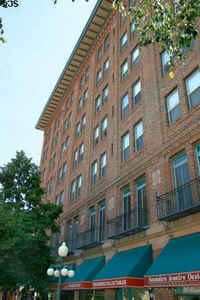 A preliminary design included a rather unusual cornice above and below the top story. The facade was a series of pilasters flanking windows vertically separated by metal spandrel panels. The facade as built became more interesting and original. The spandrel panels became brick and the cornice more Italianate; pairs of arched windows with iron balconies on the top floor and polychrome brickwork contribute to its Italian Renaissance flavor, but also relates to Mission and Craftsman styles. The primary entrance is a highly decorative two-story metal arch inset in one of the large arched openings at the base of the building. 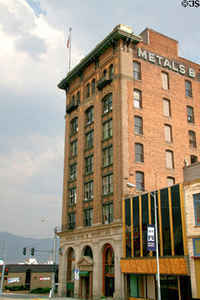 The colorful facade is animated with decorative treatments, as are most of Gilbert's western projects, including the Montana Club (1903-1905), the University of Texas (1909-1916), and the Placer Hotel (1912). The clients for the State Savings Bank were F.A. Heinze, based in New York, and E.P. 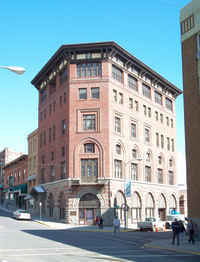 Chapin, based in Butte. Heinze was involved with United Copper Company, a firm controlled by his brother, and he was a director and the largest stockholder of the bank. Chapin managed the bank. Gilbert had many problems with the project. The first arose during the design stage when Gilbert had to please both principals. The second occurred when Chapin informed Gilbert that he (Chapin) was going to take charge of letting contracts and construction management, because as a westerner, he could get it done better, quicker, and cheaper. Chapin then decided that he should renegotiate Gilbert's contract, which had included project management in the fee. Chapin's optimism in his own abilities continued even past the completion of the project, which took twice as long and cost twice as much money as projected. Gilbert offered to personally visit Butte several times, but Chapin turned him down each time. Things became so messy that Gilbert instructed George Carsley who was managing the project for the Saint Paul office to communicate with him using cipher telegrams. [CG to Office, July 24,1906, Box 12, Fldr. 82, MNHS-CGS] All of the major players were given code names. Interestingly, Heinze was given the code name "Mann." 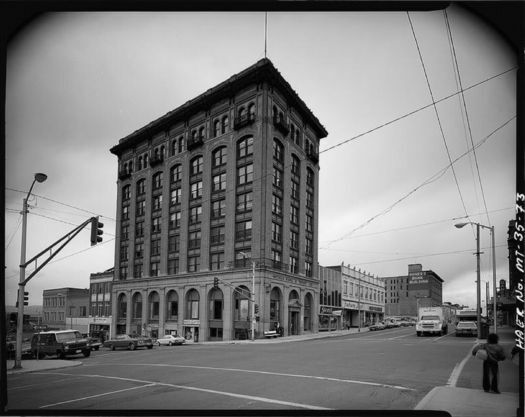 George Mann was the architect who won the Montana Capitol competition, but was fired. Also involved was a local man, C.S. Haire, Chapin's superintendent. Carsley reported to Gilbert that Haire was making minor adjustments in the plans, then passing them off as his own and presenting himself as an architect (leveraging that status to find other work on the basis of having designed the bank.) [George Carsley to CG, November 20,1907, Box 12, Fldr. 82, MNHS-CGS] A few months later, Carsley reported that Haire was retracing Gilbert's drawings and putting his own name on them. [George Carsley to CG, May 16,1908, Box 12, Fldr. 82, MNHS-CGS] In the middle of all this, the Heinze family attempted to corner the copper market. Trading was suspended in United Copper on the New York Stock Exchange. Fraud was alleged. The State Savings Bank temporarily closed its doors. [New York Tribune, October 18,1907] Gilbert filed a lawsuit to get his full fee. But just before his court date, he figured it wasn't worth traveling all the way to Butte, so he accepted a reduced fee instead. Gunvald Aus, Gilbert's collaborator since the construction of the Minnesota Capitol, did the engineering work on the extant building.